European astronomers have discovered a planet with about the mass of the Earth orbiting a star in the Alpha Centauri system — the star system nearest Earth. It is also the lightest exoplanet ever discovered around a star like the Sun. The planet was detected using the HARPS instrument on the 3.6-metre telescope at ESO’s La Silla Observatory in Chile. Alpha Centauri is one of the brightest stars in the southern skies and is the nearest stellar system to our Solar System — only 4.3 light-years away. 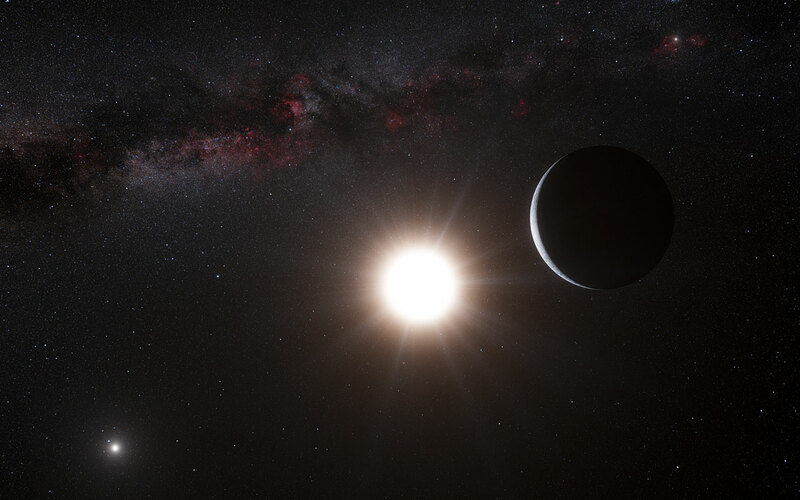 It is actually a triple star — a system consisting of two stars similar to the Sun orbiting close to each other, designated Alpha Centauri A and B, and a more distant and faint red component known as Proxima Centauri. The European team detected the planet by picking up the tiny wobbles in the motion of the star Alpha Centauri B created by the gravitational pull of the orbiting planet. The effect is minute — it causes the star to move back and forth by no more than 51 centimeters per second (1.8 km/hour), about the speed of a baby crawling. This is the highest precision ever achieved using this method. Alpha Centauri B is very similar to the Sun but slightly smaller and less bright. The newly discovered planet, with a mass of a little more than that of the Earth, is orbiting about six million kilometers away from the star, much closer than Mercury is to the Sun in the Solar System. The orbit of the other bright component of the double star, Alpha Centauri A, keeps it hundreds of times further away, but it would still be a very brilliant object in the planet’s skies.